Build completely out of made from authentic, hand-hewn, salvaged wood from log cabins and barns in the upper Midwest. A classically designed table with no pipes or steel. 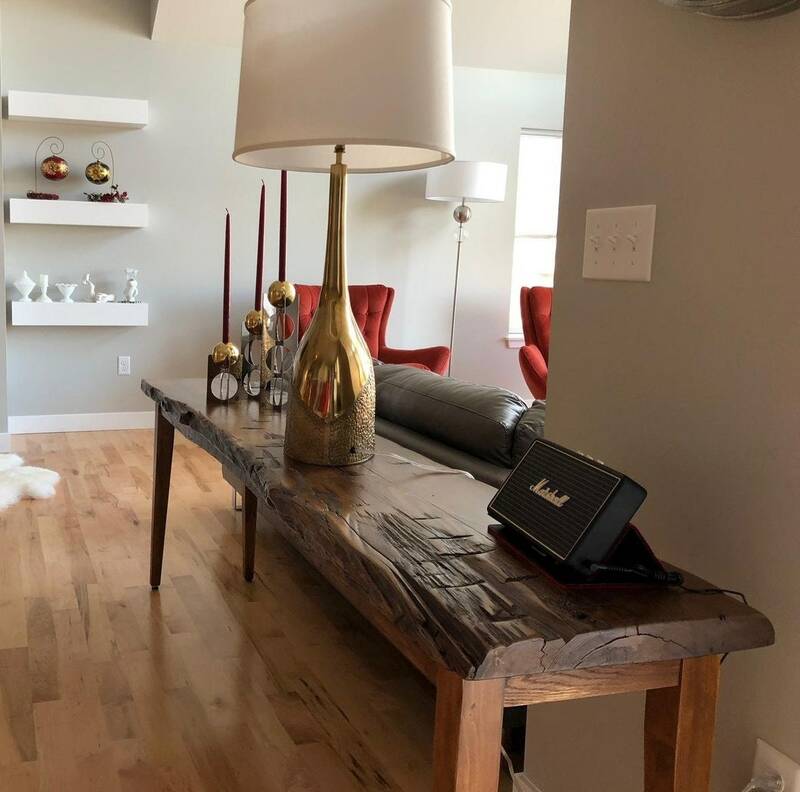 Our hand-hewn reclaimed wood tables will add character to your living room or hallway. You can feel the history, the effort, that went into making each of these planks for barns and log cabins ages ago. 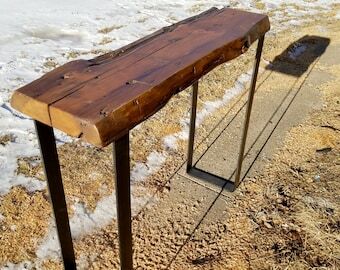 The pictured tables are 60" long, 9" to 16" wide and 30" to 36" tall. Please convo to price a size we do not have listed. We have smoothed and flattened the top surface so you can set glasses on it. Each piece IS DIFFERENT and has its own story and history. The legs come unattached. They can be attached without tools in just a couple of minutes. We are now using a very tough, low VOC, non toxic Enduro-Var that binds the wood fibers. I mix my own dyes to tint the wood. Like all reclaimed, upcycled, repurposed and recycled products there are flaws and nicks and knotholes. It's not Ikea. Domestic Shipping is now always $76. Lead time is about 4 weeks then it takes a day to box it up then off it goes. Usually we ship Federal Express Residential Delivery which gets things about anywhere in the US in less than three days. The table is fantastic - everything I wanted and more. It shipped on time and arrived as scheduled. The craftsmanship is superb. I couldn't be happier. Thanks so much. I just received my table and am thrilled to say that it looks beautiful! Everything surrounding this experience was great and I would order again from Etsy and Spoken Wood Design without a question! Chris was a pleasure to work with and delivered the product right on schedule!! Very happy about my purchase! Thank You soooo much! Beautiful and perfect. I asked for an unusual height for my table and it was exactly right.